I have always been a fan of a statement bottom piece. Whether it's jeans or a good skirt, I prefer statement bottoms to statement tops. I couldn't tell you why though. 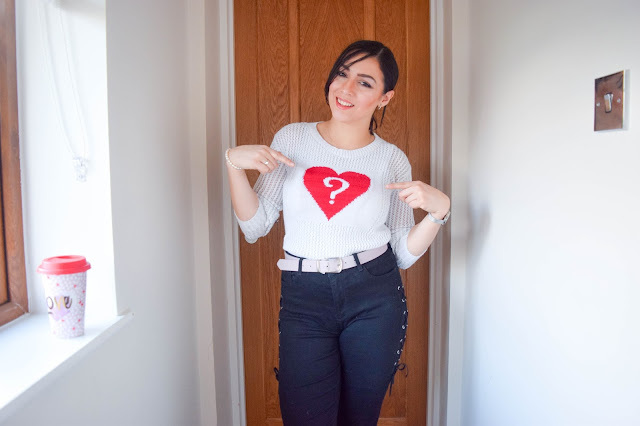 So when Simply Be gave me the opportunity to review some of their jeans and skirts, I jumped at the chance! 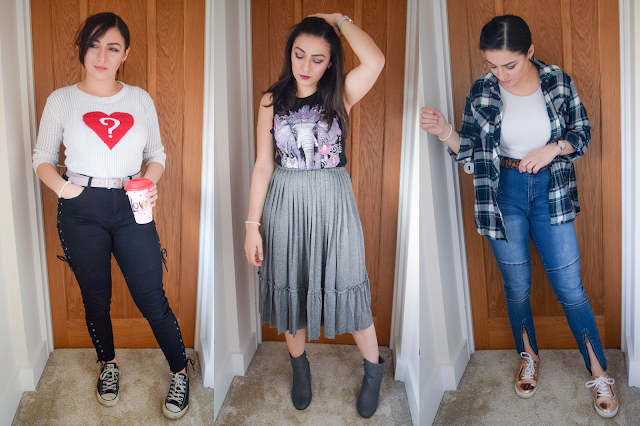 I picked up some gorgeous pieces and styled them into three different outfits. 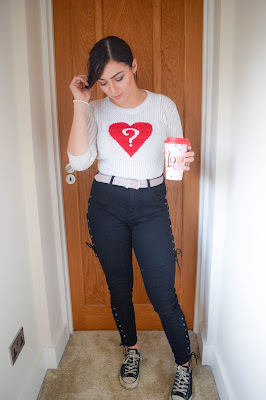 Today I have a fun valentine's day look, a 'rock-chic' look (I really didn't know what to call this one) and my casual go-to weekend look. This is a fun look for so many reasons. First of all, this jumper was a gift from a family member so many years ago! 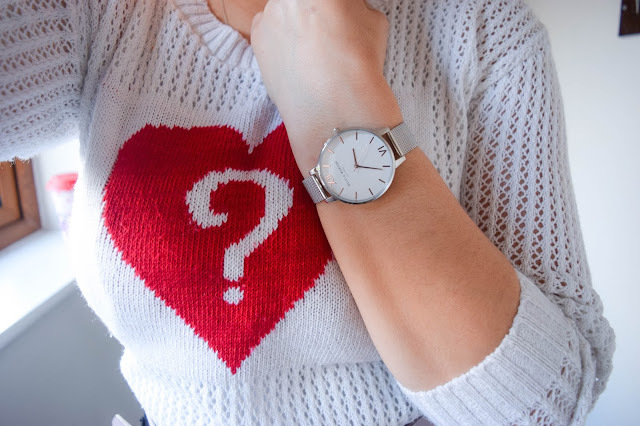 It doesn't have a brand label so I don't know where it's from but I still love it for a fun valentine's day look. It's random, it's not too thick and it's still in good quality for something I've had for so long! Secondly, how cool are these jeans? I've wanted a pair of 'laced' jeans for a while now but I didn't find many that I liked. I didn't like the ones that literally needed to be laced up but I loved these because they're just for detail. It's not too over the top though and being black on black it's a great simple statement denim piece. They're super comfy too because they're high waisted and stretchy - just how I like them! I'm also wearing my new Olivia Burton watch and showing off my valentine's travel mug I'm currently using for work. This is probably my favourite look. 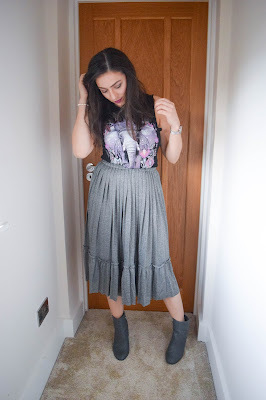 I wore this skirt the other day styled more simply with a long sleeve black top and I got so many compliments on it! It's a much loved skirt already. 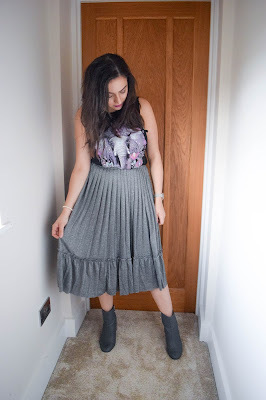 In this outfit, I styled the grey midi skirt with one of my favourite vests. Another oldie but a goody. I struggled to put this skirt together with something but after trying it with a couple of pieces, I know exactly how I'd like to style this in the future. I think this vest was perfect with this skirt to and gave me vibes from my "alternative" days. 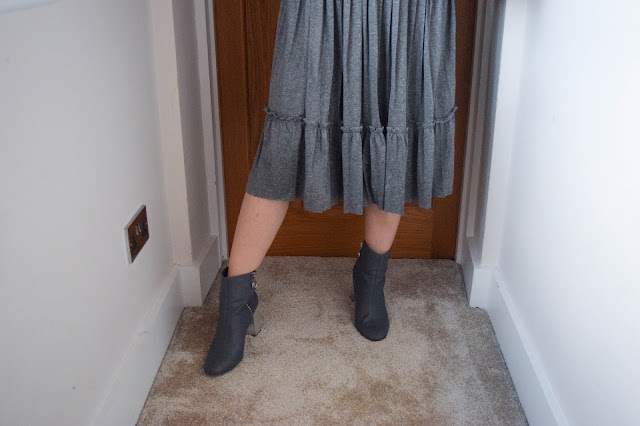 I finished up this look with my favourite grey boots. Grey on grey isn't something I thought about, again, until I tried it but it works! The shades are slightly different and the silver heel adds more interest. The skirt is awesome though, I love the ruffled details and how it adds interest to the simplest of outfits. 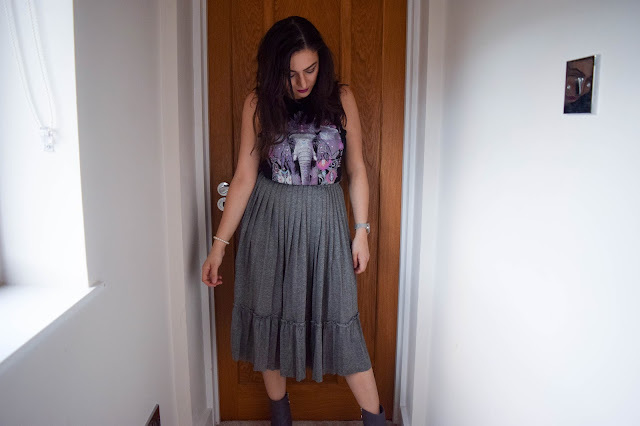 A perfect skirt to make you look like you made effort without actually making much effort! A look I will be wearing repeatedly this spring/summer for sure. My favourite looks are my weekend looks. Not only are they comfortable, I honestly think I put together cuter weekend outfits than I do weekday ones when more people see me! I wore this look last weekend and I honestly loved it. 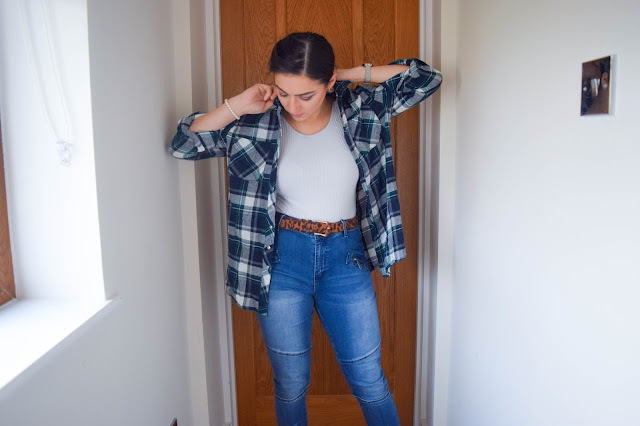 The jeans are super duper comfortable and with a simple top and a chequered shirt, it just says "relax... chill out. It's the weekend...." I adore the zip detail. I love the way it looks unzipped but I love that you can do it back up for a more 'normal' look. 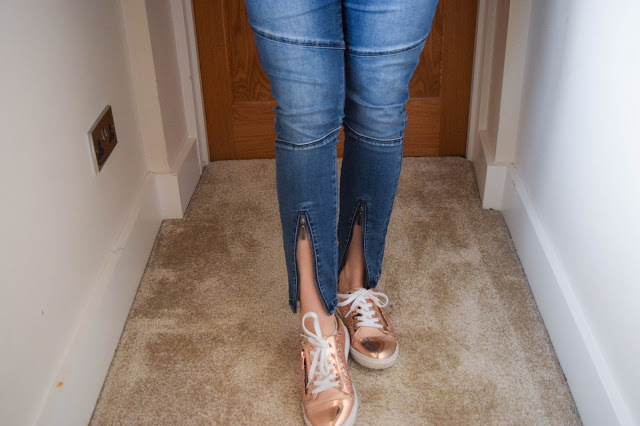 I jazzed this look up with my rose gold trainers to add some colour to the bottom of my outfit. I seriously love these jeans though. 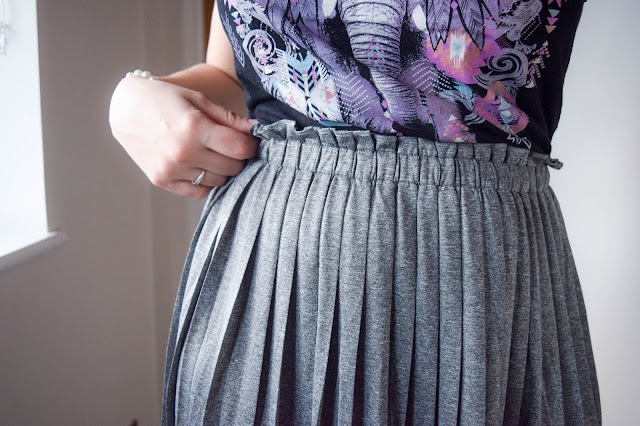 They're beautifully high waisted, they're stretchy, comfortable and so flattering! 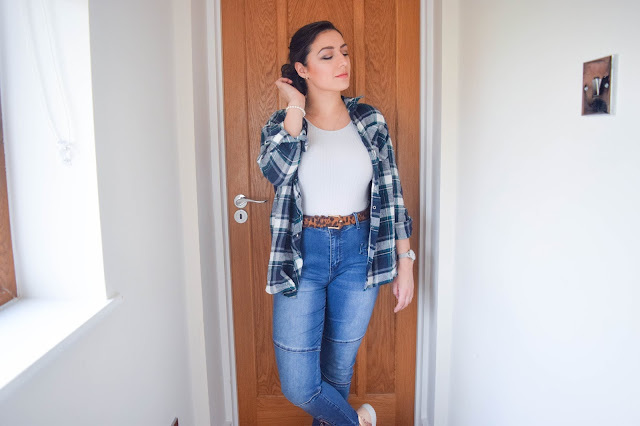 Simply Be jeans, where have you been all my 20s! ?